Scales attached with pins and glued. 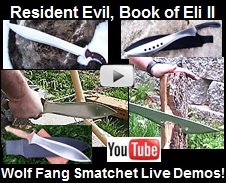 This machete is influenced from the one Chris Redfien uses in the game Resident Evil 5. Chris is a former member of the US Air Force and an experienced fighter pilot. He demonstrated outstanding firearms handling, and was trained rigorously in hand-to-hand knife combat. He has been described by his commanding officers as uncompromising, possessing unwavering dedication, and having a high level of adaptability.